Even after a decade, we're still trying to find the best edible-pod pea for our garden. But 2017 might be the year that makes the cut! 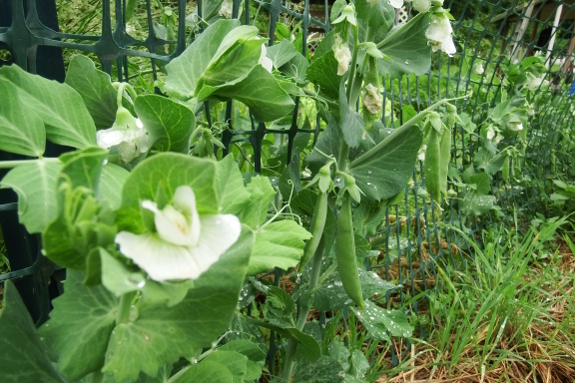 We started out growing Mammoth Melting Sugar, but those were really snow peas (to be eaten when the pod is flat) rather than sugar snaps (to be eaten when the pod is plump.) So we tried Sugarsnap and Super Sugar Snap, which did indeed give us that sweet crunch we were craving...but also quickly succumbed to a blight that wilted the plants from the bottom up before they were done bearing. Enter Sugar Sprint. The pods are plump and sweet, the vines are short but prolific, and so far their reputed resistance to powdery mildew seems to be holding true. Maybe these will be the perfect peas for us? I love Sugar Sprint! Love them so much they never get out of the garden except in my stomach! Research shows they are HEAT TOLERANT so I will try some down here in Savannah.